We’ve spent a lot of time recently discussing the importance of press releases to your business. We’ve discussed on hiring PR specialists, the importance of journalists (and what they can do for your business), how to create a media pack, clever ways to secure quality media coverage, how to build brand identity and how to deal with bad press. By now, you should be convinced of the value a press release can deliver for your business, and understand what it can achieve for you. Now, we need to talk about making sure you write an effective press release. That’s right – all of the benefits we’ve described so far will only come to fruition if you ensure you write your Press Release in the right way, include the right information, and make the right choices when it comes to everything from the creative storytelling angle to the formatting. “What’s Happened?” – In marketing, it’s great to start with the “why” – but in a press release, the what forms the basis of your story. The ‘what’ can be an event, the result of some research, a development within the business, a new product release, or something else. “So What?” – This question is important because it puts your focus on the implications of the development you’re focusing on. If you want people outside your business to care, you need to make clear, up front, why this new development affects them. What will change or improve, what problem will it solve, what new capabilities does it unlock, what does it say about the brand perception? “And How Is That A Big Deal?” – This is a challenge designed to get you to scale your news and implications appropriately. If you have to prove to the people on Dragon’s Den why it matters, you’ll understand better how to frame your perspective to catch the eye of journalists. Think about the emotional benefits for the end user of your product or service, and the implications not just for the direct problem, but for their broader lives. By answering these questions, you have a set of factual, rational and emotional arguments. Or, as the classical Greeks understood it – Logos, Pathos and Ethos. Rhetoric is the business of persuasive communication, and it has been the bedrock of everything persuasive you’ve ever heard, from Shakespeare to Martin Luther King to Rocky. When we talked about how to structure a press release, our writers recommended that people new to the game use templates to get the format right, and study samples to see how the flow or the content is presented. You can get great templates from PR Shelf, which allows you to fill in an industry and scenario specific questionnaire to receive a ‘mad libs’ style press release outline that you can fill in with the relevant details. There are hundreds of press release examples for you to choose from. This will make sure you get all the formatting right. If you’d prefer to do it the long way around, here’s what our writers said about how to structure your PR. “The Holy Trinity” – This is how they refer to the headline, summary and first paragraph. These are the most important parts of your press release, and will determine more than anything else the success of the release in gaining traction. They are also listed in order of importance. Creating a killer headline is essential, and the summary should really tell people everything they need to know. The first paragraph should mop up any missing essentials, so the remaining content is views as ‘bonus features’, contextual information and storytelling. “No Second Chance At A First Impression” – Building on the above, our writers explained why these three things are so important. They are the first impression you make on a journalist or reader, and your brand name will be peppered throughout, so you have an invaluable opportunity to establish a positive association from the outset. The first impression will determine whether people read any further. Buzz Sumo has created some incredible research by analysing more than 100,000,000 (that’s one hundred million) articles to see what made the most successful titles outperform the rest. It’s really worth checking out if you haven’t done already. “Your headline should read like it’s already news” – Think of it this way: if you have a great headline that makes people want to click, you’ve already done the most important job for the journalist who picks up the story. Write it like you’d want to read it in the paper. “No promo” – Anything that’s overtly promotional will do damage to your chances of distribution. Hyperbole is fun to write, and to read, but it will pretty much guarantee you won’t be taken seriously, unless you can achieve a self-aware tone, but this is writing on hard mode, and not everyone can detect irony. It’s safer to stay matter-of-fact. “Action!” – Verbs are important, and more importantly, active verbs. Verbs are the doing words, and active words represent your company actively doing things. Putting these in your title means you get instant dynamism, movement and a sense of ‘newsworthiness’ that passive verbs, or even the lack of verbs, could damage. So “Company LAUNCH product” not “product HAS BEEN LAUNCHED BY Company”. If you’re struggling to find inspiration for your headlines, you can use the Blog Title Generator from SEOPressor. It helps you find loads of actionable and editable examples based on a wide range of different situations and variables. Your summary comes immediately beneath your title, and should fill in any blanks and provide a teaser for the whole press release. Your summary needs to be short, just one or two sentences at most. It should give a brief but accurate description of the news you’re announcing, while encouraging the audience to read more. “Make me care” – The most important information needs to be included, and nothing else. Our writers recommend making the implications of your story clear here, so people understand why reading more will be worth it most of all. “Avoid repetition” – Your headline, summary and first paragraph are all important, but they shouldn’t repeat the same information three times. That will just convince people you have nothing to say. Rather, you’re trying to convince them there’s lots to say, AND that it’s all important. “Conciseness is king” – Your summary doesn’t HAVE to be two sentences. If you can do it in one, do that. Your first paragraph needs to start with a dateline. This includes the location of your business and the date of your release. This needs to include the City, State, and Date of press release. It must come before you start your first paragraph, as this will determine where the story is relevant for many of the journalists and audience who will decide whether or not to read on. “Get right to the point” – You’ve gotten them this far, so don’t lose them! Whatever the most extraordinary claim you have around your news is, be that an implication, capability, mission or value statement, make it in your first paragraph and as early as possible. “Give Journalists everything they want” – Journalists typically use a 5W1H system to evaluate information and the potential of a story: Who, What, Where, When, Why, and How. It’s a stretch to answer these in one sentence, but you need to make sure you’ve covered all of these in your first paragraph. “Tell us a story” – Remembering the emotional arguments from our rhetoric in the introduction, you need to hook the reader by making them invest emotionally in your story. In A Tale Of Two Cities, Dickens highlighted the widening divide between rich and poor, the complex economic and political tensions of revolutionary era France and England, and the fortunes of his main character in the opening line: “It was the best of times, it was the worst of times.” This antithesis is a rhetorical device, but it also sets up an intriguing context for the story in no time at all, grabs our attention and tells us why we should care. If you can achieve in a paragraph what he did in twelve words, you’ll be far more likely to win eyeballs for your story. “Send a bold message” – no, literally, highlight the core message of the PR in bold and insert it into the first para. That way if people read nothing else, you’ve gotten across what you wanted. IMPORTANT: Write everything that isn’t a quote from a third-party perspective. This convention helps differential press releases from advertisements, where first-person language is usually used. Otherwise it may not be fit to publish on a newswire. Other than that, what should the body content include? “Tell Me Why” – The what is certainly the most important, as are the direct implications on the reader/audience. But the why is still important, and this should be the first thing you establish in the body. You can include the companies vision and values here, and explain how this development is just the latest expression of those values. “What’s The Story” – When talking about how your newsworthy occurrence came into being, develop the story and characters around its development. Most people know the story of how Newton identified the force of gravity. Create your own ‘Eureka!’ moments. “Quote Me On That” – People sell to people, and a quote allows you to break convention and go into first person. Typically the quote comes from someone in authority from within the company, but it could also be a customer or business partner. People sell to people, yes, but people will believe people they know and trust, or at least a neutral third party, more than a spokesperson. “Exposition” – Support your story, your claims and your newsworthy development with all the relevant facts, details, references and other information that can help assure those reading that your claims are real and genuine. Remember, journalists need verifiable information, on the record, in order to publish. Putting it in your body copy eliminates the need for follow ups. “Brevity is the soul of wit” – said Shakespeare. We say “don’t waste everybody’s time”. You need to get everything across in 500 words or less. This should be able to fit on one page of A4 at a legible font size. Any more than this, and you need to start prioritizing what is really ‘need to know’, what will make the biggest and best impression, and trim down accordingly. The ‘wall of text’ of a long PR can put people off from reading any of it. At the bottom of your press release, people should be able to find a boilerplate and contact details. The Boilerplate is a short paragraph that gives people an overview of the business publishing the press release. This goes at the end of your PR, and should be a maximum of 80 words. Make sure it’s written in jargon-free, easy to understand plain English, and has a link to the website for more information. The Contact Info should include a point of contact, preferably a real person with a name. That person should have a phone number, and an email address where they can be contacted by the press for follow ups. This information will also be valuable to customers interested in your products/services. Perhaps most importantly, you build authority and trust in audiences that you are ‘for real’ by being contactable. You also get SEO benefits from having NAP and URL in your PR. You now know how to write a press release like a professional press release writer. They have shared their secrets on how to create an effective press release. Following this advice will help you retain audience engagement and get people to read your press release, which is the most important step in getting picked up for coverage by the media, and converting regular audiences into leads. The last tip? Proof Read. You need to make sure, on top of all this, that you’re free from grammatical and spelling errors before you publish. Now you’ve completed your perfect press release, it’s time you got it out there so people can see it. Use a distribution service to distribute to hundreds of regional, national and worldwide newswires to maximize the impact of your announcement. Alternatively, if reading this has left you swimming in doubts and overwhelmed by requirements, you can trust our professional press release writers from PRWire Asia to create a release for you using a brief you supply, to tick all these boxes while getting across the message you care about most. 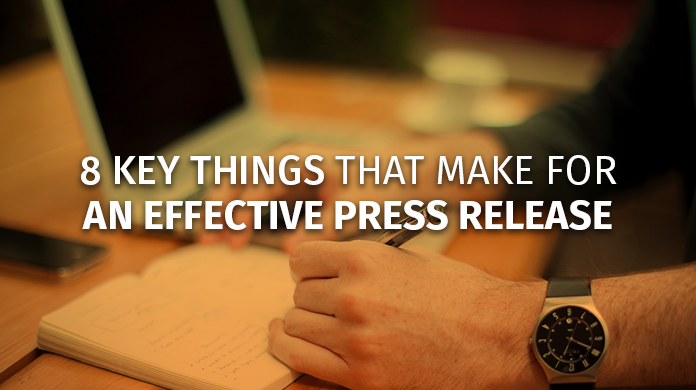 Do you have different ideas about what makes for a successful press release? Tell us in the comments below!